I am so in love with our new entry and stair case and am excited to share the stair cause tutorial with you today. The stairs are a little more complicated because you are working with angles but once you get your angles and measurements right, it goes pretty quickly. 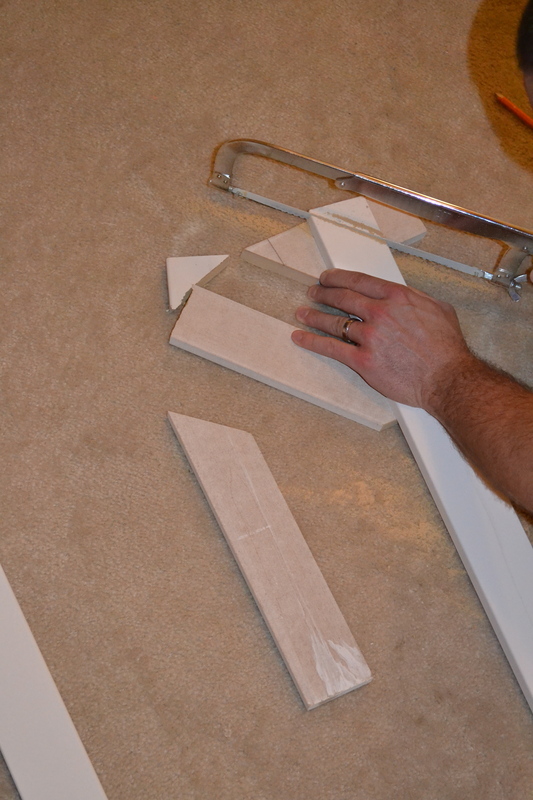 Mike started out by finding the angle of our stair case by using a angle tool on the baseboard. We found that it was 40 degrees and decided to use that same degree for our top board. We placed the board where our top entry board is to carry it around evenly. From there, we took the degree measurer and drew a line with a yard stick, carrying the 40 degrees all the way up. Then we nailed the top board in. Next, we moved on to the vertical boards. This was a little tricky at first to figure out how to cut both angles, top and bottom. Mike took a tall board and we held it up to where we were going to place it and drew a line on the back where it hit the top board and base board. Then he cut it and used that as a template for the rest of the boards. Our boards were not the same size throughout so he just used the same angle all the way and cut each board to the size we needed. We spaced the boards using the stairs. We placed a board at the center of every other step to keep our spacing even. As Mike nailed in the boards, I followed him filling in the nail holes and creases with wood putty and painting over top. Since our ceiling is so high in the entry and up the stairs, this wall treatment really makes it feel more cozy and inviting. It turned out beautiful. I just have to tell you how beautiful I think your hallway and stairs look, I have been looking for a treatment for our hallway. Our walls are in need of replastering, so this will solve the problem and I could paper above the board and batten. I love reading your blog, thanks for the inspiration! Thanks, Sara! Sounds like you have a great plan-good luck!!! I LOVE the color!l I am not a *white* paint lover…I think the B&B is pretty, but could not figure out how it would work in my house, since my house is all color. Seeing how you have done this has sparked my desire to do B&B in my home. GREAT idea, thanks for sharing! Thanks, Alicia:) I think it works really well with color! Go for it! Fabulous!! I found you while searching for pictures of board and batten on stairs. You guys did a great job, I’m loving it! Thanks, Londen! I just checked out your blog and it’s pretty awesome:) Thanks for stopping by! This is my favorite project you guys have done so far. Amazing difference! I LOVE it! Our stairs are actually in our kitchen going up from the door to the garage and so it’s a super tall wall, so we would need to rent scaffolding to paint it. This might be a good solution! Now I want a kitchen makeover (again!). A friend & I were just talking about how much we love the look of board & batten! This looks great! This turned out fab! I love that the board and batten is blue and the walls are white… opposite of most… really warmed the space. Thanks for linking my Flaunt it Friday party! I am so glad you linked up this project. It’s really super. Don’t forget to grab a party button (and become a follower if you aren’t already). Thanks. I love that you painted it such a pretty color. It makes such a beautiful statement! Love it! I really like that you went away from traditional and picked a nice color for it! We just did board and batten in our study (v-day gift to me I just love it! I LOVE this! Its FAB!!! Come on ‘ova and share this at my Linky Par-Tay! Love the board and batten! You guys did a terrific job! This looks wonderful! I know exactly what you mean about having those high ceilings—very difficult to figure our what to do with and their is that cold feeling. The board and batten absolutely warms the space up, grounds it and makes it just ‘feel more manageable’. Great job and thanks for sharing. I featured your board and batten project that you linked up last week at my blog party tonight. Please stop by to pick up your “I’ve Been Featured” button. Thank you!!! I grabbed the button today and added it to my Features page! Looks LOVELY. I really like the pop of color, totally unexpected. You go girl, little rule breaker you are. Visiting from CG. 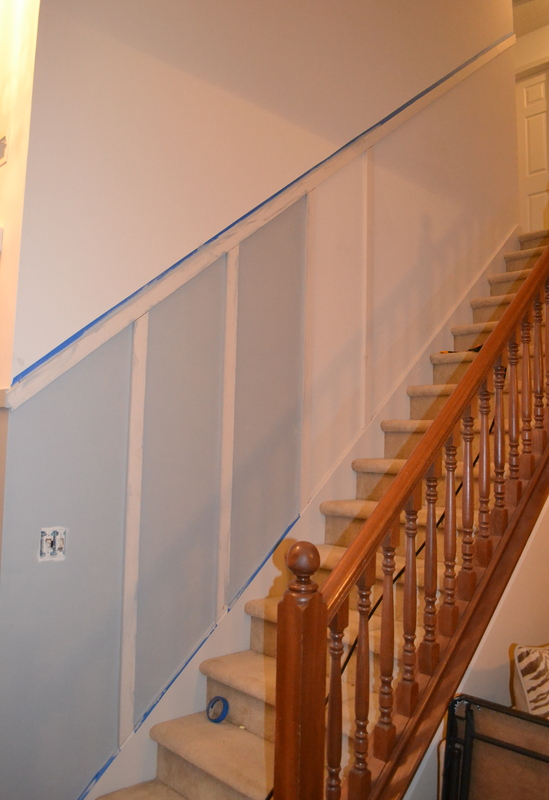 I LOVE the blue board and batten! It’s such a unique twist on all of the white board and batten that I’ve seen (and even used myself on two projects). Beautifully done. I hope you’ll come link up to the Sunday link party at Addicted 2 Decorating! What does it look like at the top of the stairs? How do you transition? Molly is 4 Months Old!